All games to the "Your Game 5" compo are now submitted and voting has started. It is time for you to vote or to become a sponsor! Вот так тихо и не заметно вышла ещё одна игрушка под альтернативную прошивку TS Labs для Pentagon Evolution. 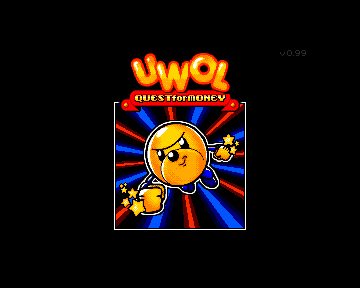 Sergey78 портировал SEGA-версию от Shiru игрушки от MojonTwins - Uwol, Quest for Money. Управление: стрелки + пробел или Kempston джойстик. Пауза - Enter. В игре используются хардварные тайлы и спрайты, поэтому для запуска нужна конфигурация TS-Labs rev.618 или новее. Задать вопросы автору и высказать свои пожелания, вы можете на форуме TS-Labs в соответствующей теме. UPD: Просьба перекачать архив с игрой, исправлен небольшой глюк. MUGEN Group in association with DELIRIUM TREMENS present a Brand New Game for ZXEvo! Incredible 4 stages with 4 bosses and 16 levels! Lots of enemies, multi-bonuses, 50fps gameplay. Hidden cheat mode, excellent music and graphics. Hardware sprites engine is not used. Game supported in TSConf revision 01.04.2012. It now can be honestly said that while the Russian game development seems to be back on its' feet, the ZX Evolution gamedev has only arose. 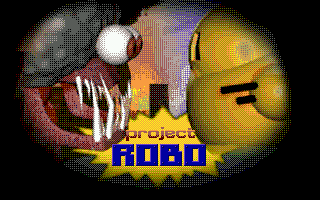 Here's a fine proof: hippiman has made this quirky blend of a top-down shooter and a rouge-like game on pure C (which couldn't be possible without the SDK developed by Alone Coder and Shiru, though), which also includes eyecandy comparable to what you may see on Sega MegaDrive and really lush music from Sprinter. 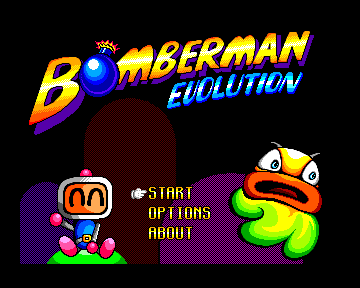 Given that this game was made for a really sophisticated Spectrum clone, most of you guys might not own an actual PentEvo, but that's not a big bother, since you can run it on a very special emulator available here (use F3 to load the game, then F12 to reset to TR-DOS and autorun the game). WASD moves the player robot while cursor keys let him shoot in different directions. Download the game itself here!